Today they work in local real estate, sell insurance and teach pre-school kids. 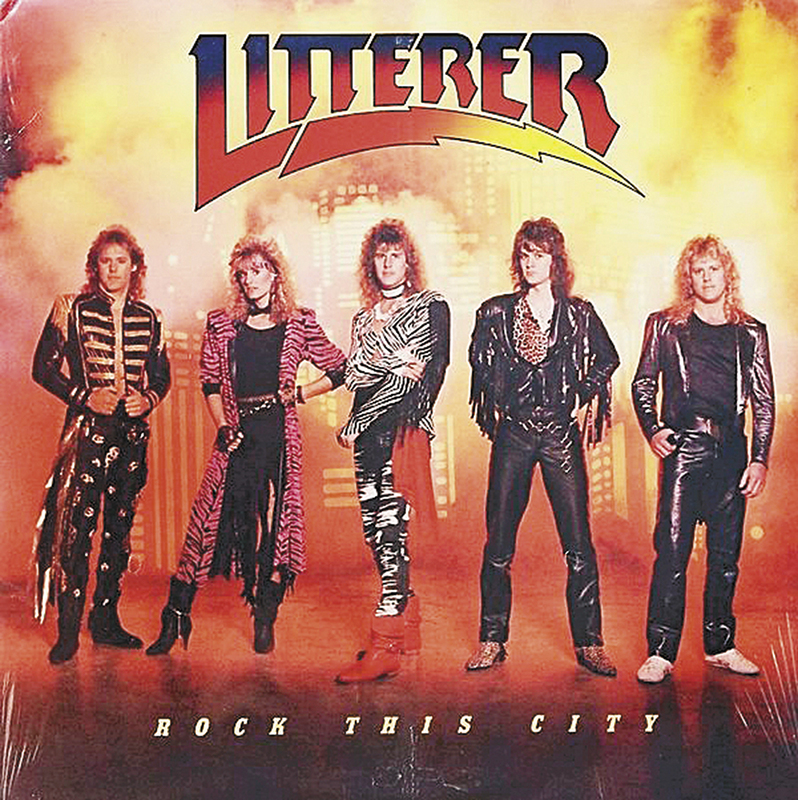 But there was a time, not all that long ago, when “Litterer” rocked this city. 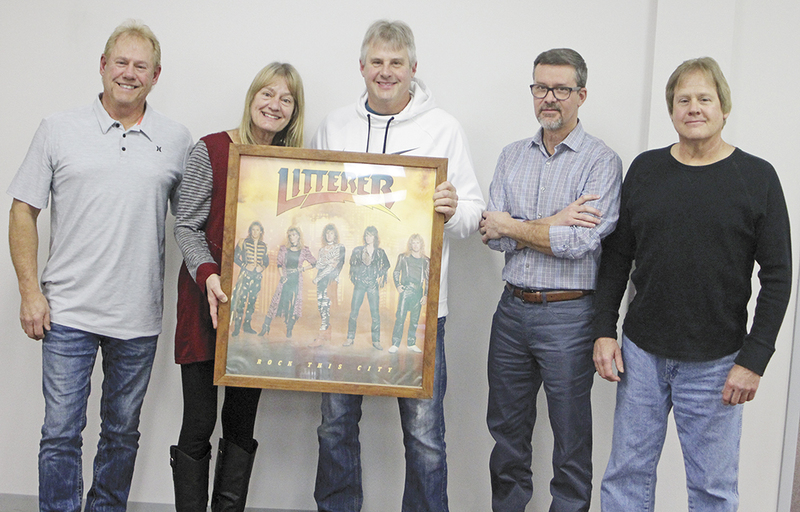 The Charles City-based hard rock music group paid its dues — from about 1980 to 1996 — by creating music, jamming and touring all over North America, and developing a loyal regional fan base over that time. They cut a pair of albums, toured with some well-known rock superstars and came within inches of landing a record deal with a major label. Then they traded in their drumsticks and guitar picks for more typical lives in their home town. 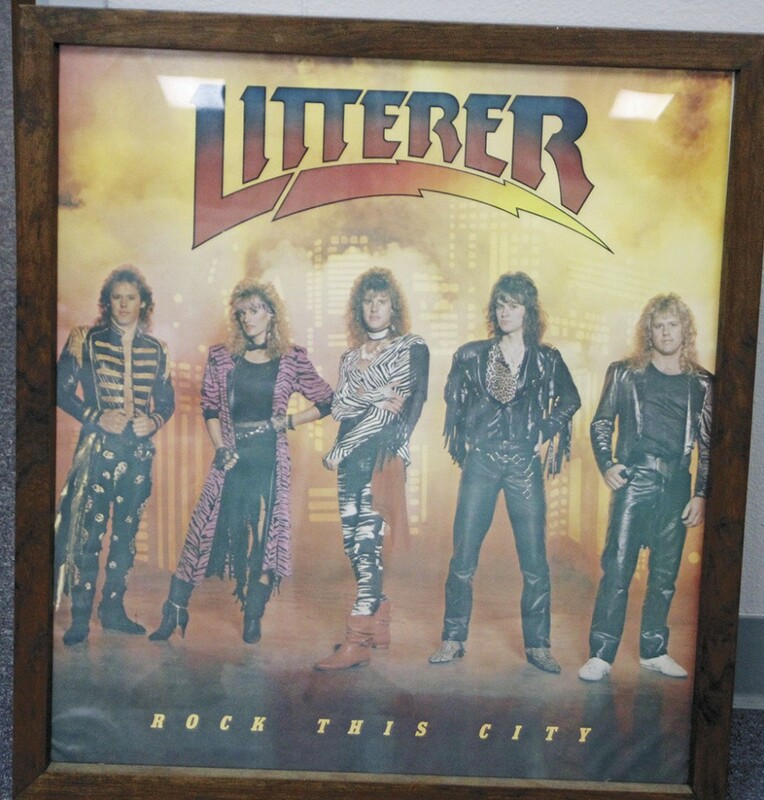 For their years of service to rock ‘n’ roll, Litterer will now be inducted into the Iowa Rock ‘n Roll Hall of Fame. Litterer topped the list of honorees when the Iowa Rock ‘n Roll Music Association announced the latest inductees on Tuesday. Each of the band members was surprised to learn of the honor, and none have been contacted by anyone representing the Iowa Rock ‘n Roll Hall of Fame yet regarding their induction. Other members said they’d been informed through calls and text messages from friends. “I had no idea we were actually nominated until I saw a news clip,” said Brent Estlund, who played guitar with Litterer for the bulk of the band’s existence. Established in 1997, the Iowa Rock ‘n Roll Music Association is an organization whose mission is to preserve the legacy of rock ‘n’ roll music in Iowa by honoring achievements, educating youth and inspiring artists. Inductees must have a minimum of 25 years of experience in the industry and have made a significant impact on Iowa’s rock ‘n’ roll music scene. Litterer’s founding members are brothers Steve Litterer, guitar and backing vocals; Tom Litterer, bass and lead vocals; and Dave Litterer on drums. They began playing and touring professionally in the early 1980s. Carleen (Litterer) Laue was their sister, and was just 15 years old when she joined the band. The group was gaining in popularity, and members wanted a bigger playlist. “We were playing a gig with the band Night Ranger, and they had the double-lead guitars going, and we decided we needed another guitar player so we could do more songs with the double-lead stuff,” Dave said. “My band opened up for their band a few times. I was just out of high school a couple years,” Estlund said. The rest of the band members credited Estlund with taking the group to new musical levels and directions. The band recorded with Tom Tatman, who founded Catamount Recording with Rick Bisbey in 1979. Tatman and Catamount would eventually outgrow that basement studio and go on to produce, engineer and mix more than 300 albums, dozens of which have been on nationally-distributed labels. Catamount is currently a multi-room studio in the Cedar Falls industrial park. “We helped build that studio,” Steve said. 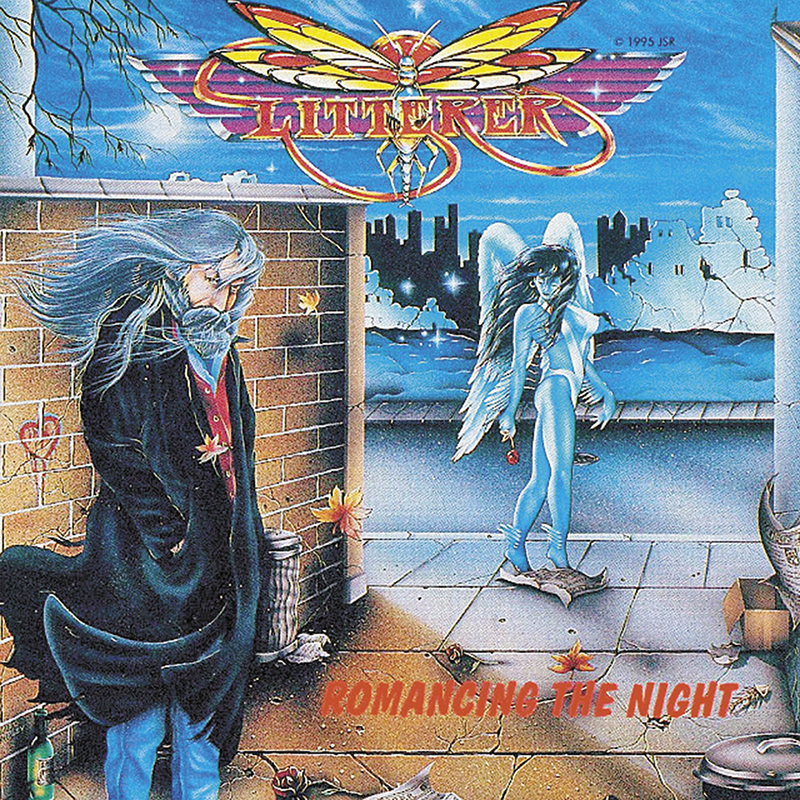 The first album, with all original music, increased the band’s profile and credibility, but it was the live shows which really helped Litterer earn a reputation and following. The word was out, and the band was rubbing shoulders with some of the bigger names in the industry. Just a few of the major artists Litterer played with include Kansas, REO Speedwagon, Dr. Hook, Night Ranger, Slaughter, 38 Special, Head East, Warrant, Ratt, The Grass Roots, the Guess Who and Autograph. Another time, Litterer was scheduled for a show with Ram Jam at the Surf Ballroom in Mason City, and Ram Jam had to cancel. The biggest indoor arena crowds band members could recall playing in front of included sold-out shows with Night Ranger and Kansas in the Mayo Civic Auditorium and at the LaCrosse Center, both of which hold over 7,000. “We had a great road crew. We wouldn’t have been able to play all those shows without them,” Carleen said. At the sold-out show with Kansas, Dave set up his drums and realized he had forgotten his cymbals. At the same show, Tom’s bass amp “blew up,” and the band approached then-Kansas guitar player Steve Morse — a hard rock legend — and asked if they could use one of Kansas’ amps. When Litterer had finished playing the show, they were celebrating in the dressing room when the road manager for Kansas barged in and began yelling at them. “Who in the hell gave you permission to use Kansas’ gear?” he asked. “Steve Walsh,” came the reply — referring to Kansas’ founder, lead singer and songwriter — and the man who was signing everyone’s check. How close did Litterer get to signing a record deal with a major label? In the mid-1980s, music industry executive Jason Flom, then with Atlantic Records, flew into Mankato, Minnesota, to see a Litterer show. “At that time, he told us it was between us and a band called White Lion,” Carleen said. Flom ended up signing White Lion to a major record deal, and that group went on to have two Top 10 hits with Atlantic, and released a handful of albums. “He told us we were equals,” Steve said. “But he said we had a strong midwestern following, and that he didn’t think he’d be doing us a favor by signing us, we were doing fine on our own. In about 1996, the rock ‘n’ roll circus was over for Litterer. “We all kind of just stopped and started having families,” Carleen said. “We settled down and had kids, and instead of going out on the road, we started going to ballet and dance classes, baseball and softball games,” Tom added. They all live in the Charles City area. ‘We all just love Charles City,” Steve said. Estlund lives in Nora Springs and still plays and performs regularly with a handful of different bands, when he’s not selling insurance. Carleen is a preschool teacher at St. John Christian preschool. The original Litterers — Tom, Steve and Dave — own and operate a local real estate business. The hard-working rock band on the road is now just a memory, but a reunion show sometime isn’t necessarily out of the question.